Dr. Aggarwal’s research and teaching interests lie at the interface between sustainability science and international development. A central focus of her research has been on examining the links between globalization, resilience of social-ecological systems, and human well being. In current research she is examining the emerging conflicts in the framing of water as a human right as well as an economic, ecological and social good in rapidly urbanizing regions, with focus on Delhi, São Paulo and Johannesburg. She is also currently engaged in research projects examining the impacts of globalization and climate change on agricultural and water governance, farm livelihoods, and food security in India, Nepal, Thailand, and Arizona. Dr. Aggarwal has also worked as a senior consultant for the United Nations University’s World Institute for Development Economics Research and the World Bank. 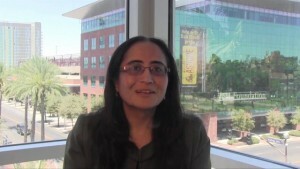 In recognition of her efforts in “use-inspired research” and “community outreach,” Dr. Aggarwal was awarded the Arizona State University President’s Award for Sustainability in 2010.